This is a book about the exhilaration and the catastrophe of embodiment. Analyzing different instances of injured bodies, Peggy Phelan considers what sustained attention to the affective force of trauma might yield for critical theory. Advocating what she calls "performative writing", she creates an extraordinary fusion of critical and creative thinking which erodes the distinction between art and theory, fact and fiction. The bodies she examines here include Christ's, as represented in Caravaggio's painting The Incredulity of St Thomas, Anita Hill's and Clarence Thomas's bodies as they were performed during the Senate hearings, the disinterred body of the Rose Theatre, exemplary bodies reconstructed through psychoanalytic talking cures, and the filmic bodies created by Tom Joslin, Mark Massi, and Peter Friedman in Silverlake Life: The View From Here. 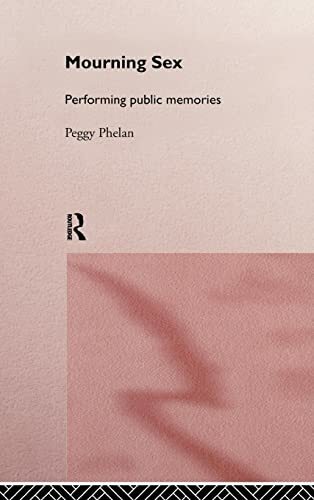 This new work by the highly-acclaimed author of Unmarked makes a stunning advance in performance theory in dialogue with psychoanalysis, queer theory, and cultural studies. Peggy Phelan is Chair of the Department of Performance Studies at Tisch School of the Arts, New York University.